Bernard Allison is the son of the legendary bluesman, Luther Allison. I want to get that fact out of the way early, because lineage is always a factor when an artist has a famous parent. 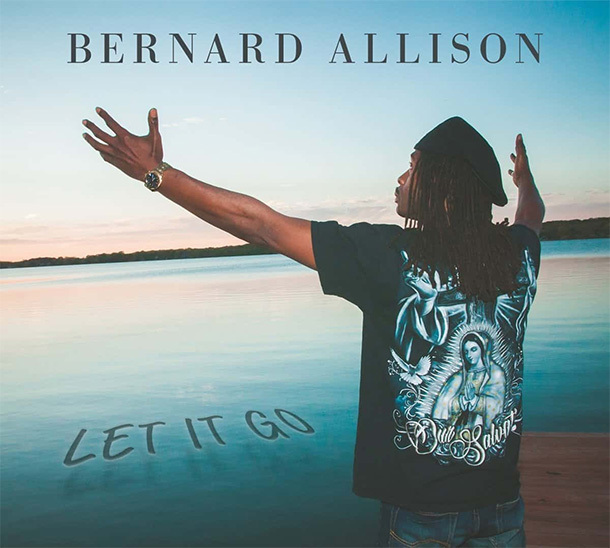 But Bernard Allison isn’t just some kind of novelty act cashing in on a famous name, as evidenced both by his long career, but also by Let It Go, his new, and brilliant, album. The challenge of the blues, for all artists, is connecting to its rich history while also sounding contemporary. Allison navigates that challenge perfectly, creating an album that is timeless. “Cruisin for a Bluesin,” the album’s lead-off track, sounds like a lost Stax cut, with its walking bass line, Allison’s laid-back vocals, and his bold, wild soloing throughout the song. “Backdoor Man” is just as funky, but also somehow like Bob Dylan’s “Foot of Pride” reborn in the Missippi delta. A few songs later, on “Hey Lady,” Allison plays over a slinky rhythm-and-blues groove that resolves into a chorus not unlike Eric Clapton’s “Bad Love.” In every case, Allison is bringing blues touchstones into a modern setting. It’s not just the quality of the songs that makes this album such a great listen, but the song variety. Allison subtly moves between styles without the album ever sounding random. Everything fits together perfectly. He even concludes with two of his father’s songs, which is interesting since Allison doesn’t sound especially like Luther; he actually has more of a Muddy Waters sound. But the two songs fit perfectly into the rest of the album. Let It Go shows Allison’s mastery of the blues. Not only does he know the licks and the structures but he also knows how to assemble them together. He’s created an album that manages to sound both modern and old; an album that sounds bluesy but not derivative. It’s a beautiful work of art.